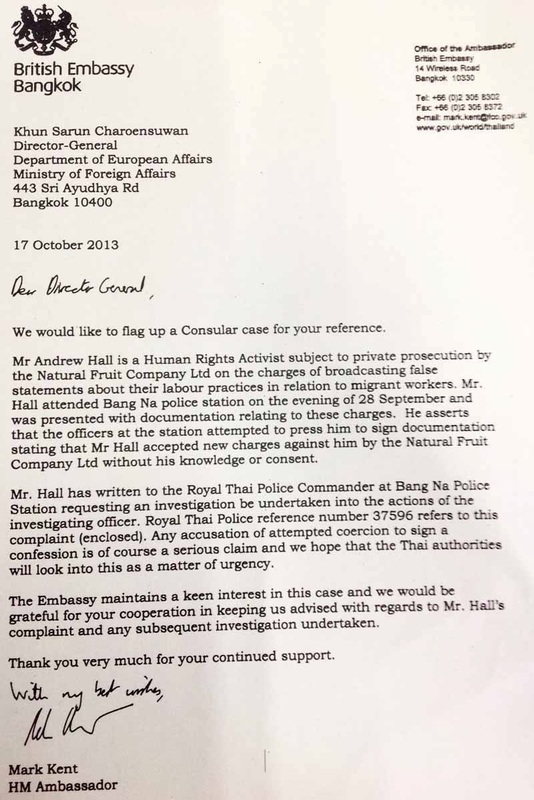 Documents obtained by human rights activist Andy Hall under the UK Freedom of Information Act show that British Embassy officials could not warn him that when entering Thailand he could be arrested. Although the Embassy were in possession of the facts and had information from Thai Police that he was about to be arrested by them they could not interfere with the Thai judicial system. 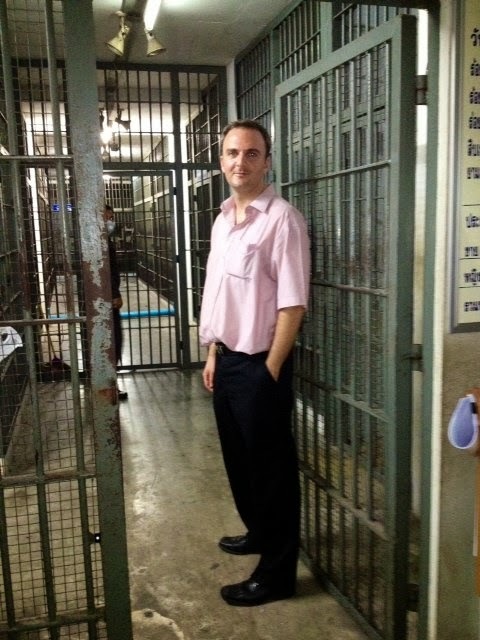 Andy Hall is being sued by the National Fruit, of Prachuap Khiri Kan, under the Thai Criminal Libels laws and Computer Crime Act for allegedly Broadcasting false statements to the public media. He was interviewed on al Jazeera Television in relation to a report by Finnwatch which detailed bad labor conditions for Burmese workers at National Fruit’s pineapple factory. In the U.K. there is no criminal libel law. It is a civil offence, and no Computer Crime Act, which was created in Thailand in the interests of national security, but has been widely used by established figures, and even convicts, to protect their reputations. 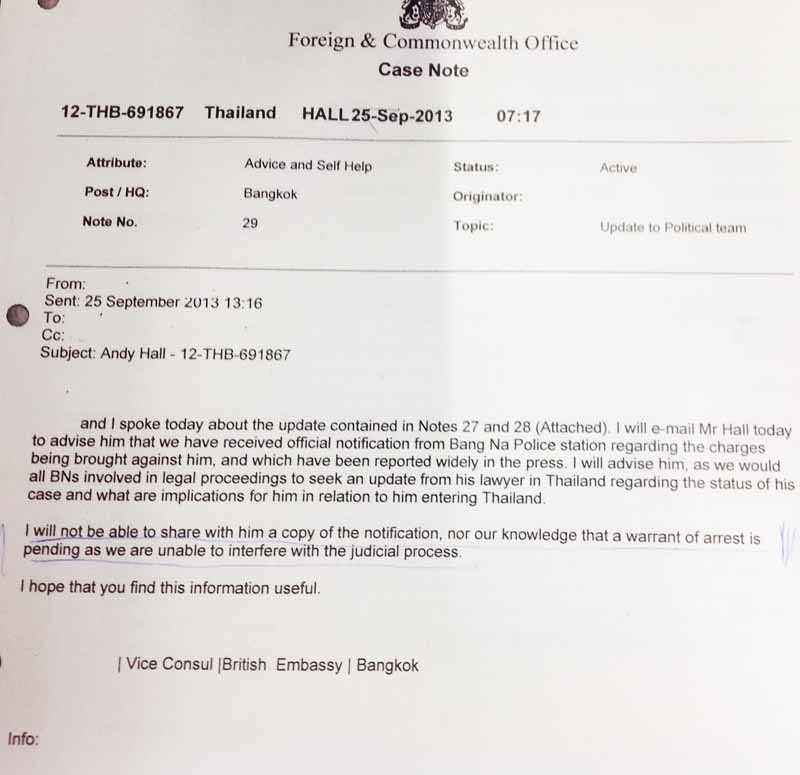 The Embassy did ask for permission from the Royal Thai Police to tell Andy Hall or rather share his arrest document, but the reply is not known or shown. The British Embassy appears to be walking a tightrope. It should not assist in the arrest of a British citizen for ‘offences’ which would be perfectly lawful in the U.K. and could only be subject of a civil suit, but on the other hand should co-operate in law enforcement issues. 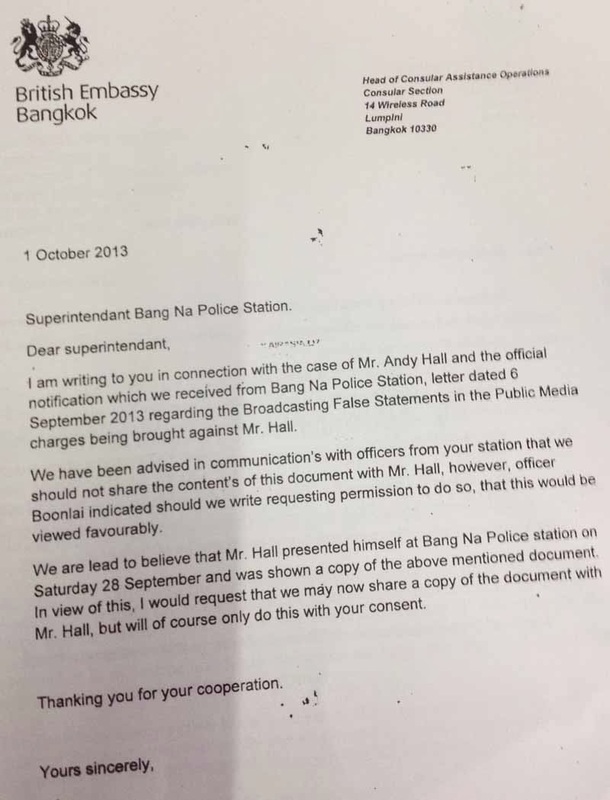 The organization Front Line Defenders has expressed concern that a document prepared by Police Lieutenant Boonlai Chaitip, Investigating officer at the Bang Na police station “contained a clause stating that the Andy Hall confessed committing the acts described therein. The Ambassador did however express concern at allegations that police had falsely presented a statement attributed to Hall in which he confessed. Hall has of course has denied confessing. He is also being sued for US$10 million damages.